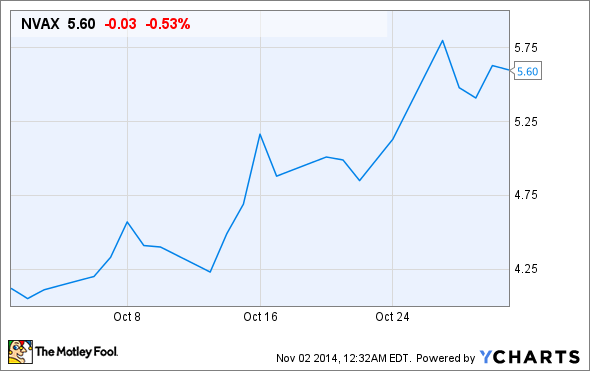 Novavax was a top biotech stock in October with a massive 34% gain. See what made Novavax shares shoot to the moon, as well as whether or not its meteoric rise can continue. What: Shares of Novavax (NASDAQ:NVAX), a clinical-stage biopharmaceutical company focused on developing vaccines and adjuvants to fight various types of infectious diseases, skyrocketed 34% in October, based on data from S&P Capital IQ, after announcing news for three separate disease indications. So what: To be clear upfront, Novavax's announcements were all at separate times and didn't come in one lump-sum, which has allowed the good vibes surrounding this vaccine maker to build all month. First, Novavax announced the initiation of a midstage study of its respiratory syncytial virus (RSV) F-protein nanoparticle vaccine in elderly patients aged 60 and older in mid-October. The trial will evaluate the incidence of hospitalizations due to RSV and will assess the safety and immunogenicity of its RSV F vaccine. Additionally, Novavax presented data on its RSV F-protein vaccine at the Vaccine and ISV Conference in late October. International Society of Vaccines presentation slide. Source: Novavax. Secondly, Novavax surged after announcing its first Ebola vaccine candidate at the Vaccine and ISV Conference. Novavax notes that its Ebola candidate was based off the 2014 Guinea Ebola strain's genetic sequence and that non-human primates were currently being studied. A human phase 1 trial, assuming all goes well, could begin as early as Dec. 2014. Considering Americans' Ebola fears at present you can probably understand why this news shot Novavax markedly higher. Lastly, on Oct. 29 Novavax excited investors when it announced that the Food and Drug Administration granted fast-track designation to its H7N9 virus-like particle vaccine. The vaccine is currently being developed under contract with the U.S. Department of Health and Human Services Biomedical Advanced Research Authority, and the fast-track designation could expedite its review, as well as give Novavax quicker feedback on how to get an FDA approval. Now what: Clearly there's a lot going on for Novavax, but we have to put into perspective the up-and-down nature of the vaccine business. Take Novavax's Ebola vaccine for example. Though it caused shares to rocket higher it is among nearly one dozen companies currently vying to develop a vaccine. In addition, it'll be nowhere near the first company to finish clinical studies of its vaccine. Though that doesn't discount the possibility of it being effective, this is a case where being first-in-class could net big rewards. I'm willing to suggest that Novavax won't be anywhere near the front of the pack in terms of Ebola vaccine development. Also, we should take into consideration that none of Novavax's current studies are beyond phase 2. Again, this doesn't mean they won't be successful, but given that government needs for vaccines can ebb and flow Novavax's research and development costs aren't guaranteed to be recouped even with an approval. At a current valuation in excess of $1.3 billion I believe investors are letting their emotions rather than their judgment get the better of them. On that note, I'd suggest sticking to the sidelines until we have more concrete late-stage data to feast on before getting too excited about Novavax.